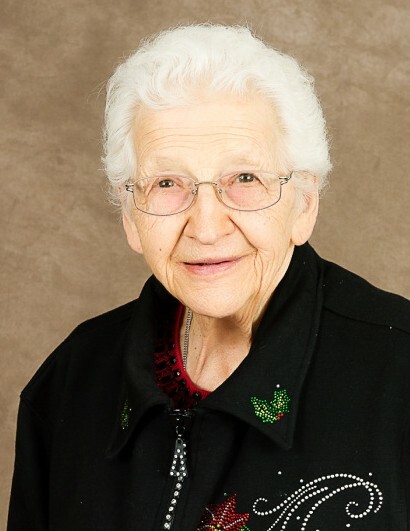 Theresa Kasper formerly of Ellendale, MN passed away peacefully in the arms of her loving family on November 13, 2018 at the age of 91 at St. Mary's hospital in Rochester MN. Mass of Christian Burial is set for Saturday, November 17th, at 10:30 am at St. Columbanus Church, Blooming Prairie. Father Thomas Niehaus will officiate. Interment will follow at St. Mary’s Cemetery in Newry Township. Visitation will take place Friday, November 16th, from 4-7pm at Brick - Meger Funeral Home in Owatonna, MN, and one hour prior to the service at the Church. Theresa was born on April 4th, 1927 daughter of Joseph and Dora (Houdek) Renchin. She gaduated from Hayfield High School. She was united in marriage to James Kasper on November 18th, 1947. She worked at many places including: Owatonna Tool Company, Ellendale school, Food service industry, Steele County Home Health Aid and Amway distributor. Theresa enjoyed gardening, sewing, shopping and volunteering with 4-H and at the Blooming Prairie Nursing Home. Theresa was an active member of the St. Mary's Church and was active with the Minnesota Citizens Concern for Life. She had a big heart for her family and friends. She enjoyed farm life, church and being active in the community. She always welcomed everyone into her life and into her home. She is survived by her children Pauline (Richard) Fetterly of Faribault, Barbara Bremer of Plymouth, Robert (Rochelle) Kasper of West Concord, Kathy (Steve) Nelson of Albert Lea, Mary Therneau (Pat Taylor) of Grand Rapids, Clara (Dennis) Valen of Estherville, Iowa, David (Leanne) Kasper of Rushford, Veronica (Michael) Graif of Byron, George Kasper (Sue Jacobson) of New Prague, Peter (Karen) Kasper of Owatonna, Cynthia (David) Johnson of Owatonna, Sidney (Martha) Kasper of Northfield, Paul (Deb) Kasper, of Faribault ,Thomas (Annemarie) Kasper of Loretto, Blanche (Rick) Brink of Rochester, Theresa (Scott) Sendek of Byron, Roseann (Joe) Morrell of Prior Lake and Angela (William) Christianson of Brooklyn Park. She is survived by 56 grandchildren and 49 great grandchildren and her sisters Margaret Koziolek, Alice Arnold, Rosemary Besch and brothers-in-law Vernon Ginder and Mark Kasper. Theresa is preceded in death by her husband James, parents Dora and Joseph Renchin, sisters Dorothy Virning, Francis Blakestead, Sylvia Ginder, Rosella Renchin, one brother David Renchin, one grandchild and two great grandchildren.